Editor's Note: This post is a product review of designer sunglasses by SmartBuyGlasses. Do you have a favorite “age defying” product? I’ve lost track of the number of supposed wrinkle-reducing, eyes-brightening, skin-illuminating, hair-smoothing products I’ve tried since turning 50. Suffice it to say, I’ve tried a lot. At this point, my favorite “age defying” product is one I’ve been wearing since college: Sunglasses. I’ve yet to discover a more effective or faster way to conceal the pesky effects of aging and sleeplessness on my eyes than with a pair of dark shades. So…when the folks at SmartBuyGlasses asked if I’d like to review a pair of their designer sunglasses, I said, “Yes, please!” The online company offers designer sunglasses for up to 60% off their original prices. A few days ago, I received a pair of Marc By Marc Jacobs sunglasses from SmartBuyGlasses (photo above) and can’t get enough of them. That’s me in my dad’s front yard, on the way out with the family to celebrate dad’s 88th birthday! It’s always a pleasure to receive a great product (more on my new sunglasses in a little bit), but I was particularly excited about the chance to see how the process of choosing a pair of glasses online works. At SmartBuyGlasses, customers can virtually 'Try On' sunglasses. The company, which is part of an international optical group, has an impressive selection of designer glasses from distributors around the world. Customers can select from over 160 designer brand names, including glasses by Calvin Klein, Prada and DKNY. It’s great to have so many styles and colors to choose from, but then, it can also be a tad overwhelming. Thankfully, the site's 'try on' option, which is super easy to use (requires Abobe Flash Player), allows a customer to zero in on the most flattering frame shapes for her. Next, I went back to the site's home page and sorted the collection for "sunglasses" (the company also offers glasses and contacts), "women’s," and "oval." I found lots of styles I really liked. Each pair of sunglasses has a style page, which includes the sunglasses's measurements for lens width, bridge, lens height and temple length. I found that information really helpful as well. Not every style I liked was currently in stock, but plenty were. I chose the Marc by Marc Jacobs sunglasses (above), but would have been happy to try a pair of sunglasses by Ralph by Ralph Lauren and Tory Burch. SmartBuyGlasses offers designer glasses for up to 60% off retail prices. According to the site, the Marc by Marc Jacobs sunglasses were reduced 23%. I received my glasses via Federal Express in about a week. I can honestly say they were exactly what I expected based on the virtual 'try on' and the product's description. 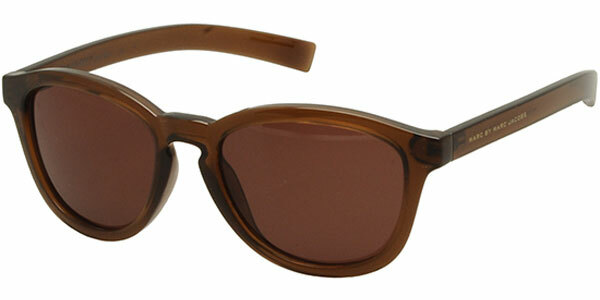 The glasses consist of transparent brown acetate frames and dark brown Polycarbonate lenses. They came with a hard eyeglass case and cleaning cloth. The whole experience of shopping for sunglasses online was, of course, “risk free” for me because I was given my new sunglasses for review purposes. But I would recommend SmartBuyGlasses to my over 50 girlfriends because of the 'try on' feature and the company’s 100% guarantee satisfaction policy. That is, if you aren’t completely satisfied with the product, you can return it. There is free shipping on all orders all the time. According to the website, shipping usually requires 1-3 weeks. But if you're in a hurry, you can sort the designer sunglasses collection for those pairs that offer "fast shipping" under "Special Features." If a customer isn't 100% satisfied with her sunglasses, she may returned them for a full refund. However, the customer must pay the return shipping fee. If like me, you receive glasses from a foreign distributor, fear not. A company spokesperson assured me that United States and Canada customers are given a return shipping address in their own country. Also, if a customer returns a pair of glasses and wishes to try another pair, the new pair of sunglasses will be shipped for free. All in all, I found my SmartBuyGlasses experience easy and satisfying. The 'try on' feature was a snap to use and took the guesswork out of shopping for sunglasses online.